V2B Valve Caps, Accu-Pressure Safety Products, Inc.
Inflate, deflate or gauge directly thru the V2B saving time during inflation and pressure checks. Automatic inflation systems lock right onto the V2B. Seals like a high pressure cap, yet offers the convenience of an inflate thru extension. 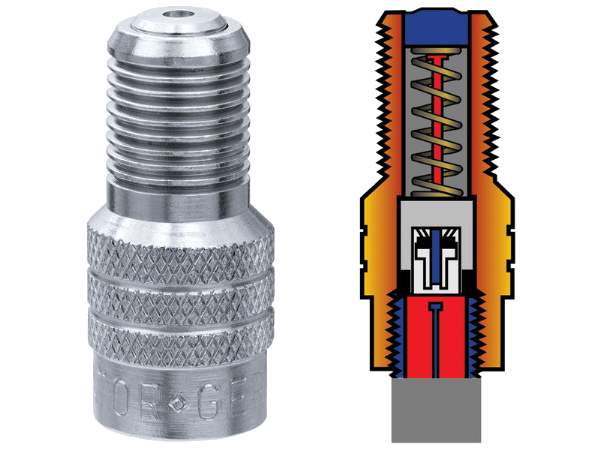 The V2B performs like a check valve the seal becomes tighter in the event of a core failure. Heat resistant grommets provide additional protection for extended high temperature running. Features tough all metal housing, precision fit brass components and durable self sealing O-Ring. The V2B is an inflate thru sealing valve cap. The V2B is used in place of a standard valve cap. The V2B Saves Time - It does not have to be removed and replaced to check air pressure or to add air. The V2B is more permanent than a cap. Caps are often left off after checking pressure; the V2B does not have to come off, so it will not be lost. Inspect the valve stem to make sure it is not damaged and does not have a protruding valve core. Core pin must not be above top of valve mouth. Install the V2B onto the valve, finger tight. Do not use pliers. The V2B is a cap. It does not require an additional cap. Gauge and inflate directly through the V2B. Do not remove it. The V2B is grooved at the top to accommodate various lock-on chucks and automatic inflation devices.